Incredible colors fill the sky and reflect off Lake Audy in Riding Mountain National Park in Manitoba at sunset. Visitors can enjoy the beauty while fishing off the wharf into the calm waters. 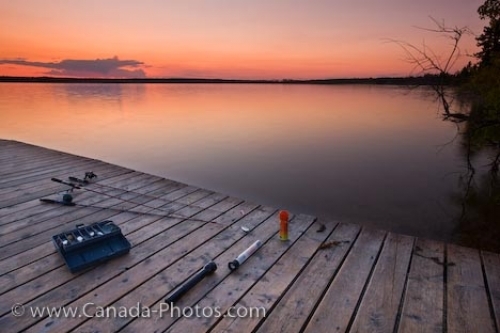 A beautiful way to spend the early evening hours while vacationing at Lake Audy in Riding Mountain National Park in Manitoba, is to fish off the wharf as the sunset hues highlight the sky. The scene is very peaceful as the soft pinks span across the horizon and reflect off the surface of the lake. Most of the rustic campgrounds in Riding Mountain National Park border Lake Audy and fishing is only a short step away. Other activities to enjoy at Lake Audy besides fishing are boating, swimming, canoeing, camping, horseback riding and hiking. This serene lake surrounded by boreal forest, is approximately 25 miles from Wasagaming. The campground only has the service of well water and toilets, making this paradise for outdoor enthusiasts. The only noises heard during the sunset hours are the wildlife calls or nature itself. Picture of fishing equipment on the wharf along the shores of Lake Audy in Riding Mountain National Park in Manitoba at sunset. Fishing equipment laid out on the wharf at Lake Audy during sunset, Riding Mountain National Park, Manitoba, Canada.